Trucking law is specific to commercial carriers and even more specific to transport. Nevada has 16 counties and is an interstate highway link to such cities as Los Angeles, San Diego, Long Beach and San Francisco to Phoenix, Salt Lake City, and the entire Mid-west, East Coast and South. There are over 200,000 miles of linked highways in the United States. Commercial drivers are flowing on the highways at all hours of day and night, and mistakes happen. Per the DMV, the maximum operating weight is 129,000 pounds for truckers working in Nevada. The Nevada Department of transportation will guide truckers with numerous rules relating to the road, but must run consistent with the Federal Trucking law. Commercial drivers passing through Nevada must operate using our laws. 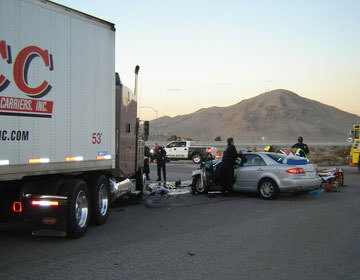 Nevada Semi-trailer attorneys know the right questions to ask in the event a major accident occurs on our freeways. Joint and several liability is a unique law to Nevada Trucking Attorneys given the ability to find 1% liability in a multi-vehicle accident. If a tractor-trailer was driving a few miles over the speed limit, and that contributed to the incident, then a prudent attorney would use that to collect damages from the trucker's owners. This concept should not be overlooked when examining the issues that confront a Plaintiff if the case appears to be under funded from an insurance perspective. The Joint and several liability hook should get major attention if more than two cars are involved and one of them is a tractor trailer or 18 wheeler. Truckers can be victims of other truckers. Usually this occurs when one of the Truckers is stopped. Department of Transportation (DOT) regulations require warning devices be put out to warn other drivers after an emergency stop. Even with cones or flares, truckers make mistakes, misjudge the distance between cars and cause accidents with absolutely devastating impacts. Trucker wrongful death actions are inevitably filed as fatalities are extremely common. 18-Wheeled big rigs are a class of carrier governed by the U.S. Department of transportation (DOT). The D.O.T. mandates that 18-wheelers abide by a class of rules limiting how long a driver can be behind the wheel and how long they are allowed to drive before resting. 18 Wheeler Lawyers must understand the complexities of navigating major trucking injuries and the pitfalls that inexperienced lawyers will make. Having represented multiple trucking accidents we know what it takes to make a successful case. Driver's who have a commercial driver's license (CDL) are trained and licensed by their home state requirements. Commercial truckers differ from regular truck drivers in that the US DOT and the Federal guidelines for interstate travel govern them. Guideline for rest and fatigue are mandated and these truckers must subject themselves to drug testing and rest schedules to operate on the highways. Commercial truckers do not always own the load they are carrying. For example Wal-Mart Transportation, LLC is a subsidiary of Wal-Mart stores and insulates the main corporation, Walmart, from transportation risks. Wal-Mart Transportation usually owns the rigs and employs the drivers who ship goods interstate. The relationship between commercial truckers, the rig owners, and the trailer owners can sometimes be complicated based upon the business arrangement. Many truck drivers are independent and thus own their own rigs and for a fee will drive the goods from point X to point Z. Risk of loss is usually spelled out in common carrier contracts. If you have been injured by a commercial trucker and need a Las Vegas Trucker Attorney, please call us for a free consultation. Trucks carrying hazardous materials need special licenses to operate, and must be listed with an identifying mark for HM. These specially endorsed vehicle often require a hazmat team to clean up at the scene. These can be the heaviest loads around as they are liquid, which carries no air. Not only is the clean up a mess to deal with, the hope is that the chemicals or hazardous material does not interact with the human occupants. Burns can horribly afflict the passengers or drivers, and the recovery can be a very long road. The most devastating truck collisions are head-on collisions. These types of collisions result in fatalities most of the time given the extreme weights of the vehicles and the heavy loads. A head on collision with a tractor-trailer usually means the rig or the opposing vehicle left its lane of travel into oncoming traffic. Sleep deprivation, fatigue and other factors including distracted driving can cause complete devastation. Cars will lose this battle 100% of the time. When tractor-trailer's jack-knife causing the cab and trailer to pinch the body of the trailer can cross multiple lanes of travel. Much of this is caused by severe braking or sudden deceleration by way of a rear-end collision. Under high speeds and high force the resulting accidents are horrific given the rig will take up many lanes. When a tractor-trailer jack-knifes the trailer is exposed creating an extreme hazard for oncoming and ongoing traffic. Major head injuries result when cars go under trailers at high speeds including decapitation, fatal head contusions, and brain damage. Budget Leasing, U-haul and other commercial trucks are involved in numerous accidents every year. The problem is with these trucks is lack of insurance coverage that usually piggybacks larger carriers. Leasing trucks are only covered under Nevada Law for $15,000 limits. Nevada's short-term lessor statutes control the mandatory insurance requirements. For this reason, rental truck accidents can be horrible because not only are the damages great, the injuries significant, but the insurance coverages are usually low. UPS and FEDEX carriers are much larger businesses and thus carry much larger policies. Utility Trucks, Water Trucks, Nevada Energy Trucks, Flat Bed Trucks, Tow trucks, Refrigerated trucks, gravel trucks we have dealt with nearly every type of trucking accident and we look forward to helping you. The laws of physics dictate that forces will continue on when acted upon by another force. Newton's laws of physics stand for the proposition that the velocity of a body remains constant unless an external force acts upon the body. The acceleration of a body is parallel and directly proportional to the net force and inversely proportional to the mass, and the mutual forces of action and reaction between two bodies are equal, opposite, and collinear. When a Truck fails to slow down and rear-ends another the force of the rig is transferred into the stopped vehicle in front. Trucking rear-end accidents are horrific. Benson & Bingham have handled many, very severe, accident cases. The forces often push the vehicle occupants through the front shield window causing major head, neck and shoulder injuries if the victims are lucky enough to survive. Catastrophic brain injury is also a likely result. It is imperative that the proper trucking experts are retained and the proper medical experts hired to explain the extent of the damage. We only work with the top physicians to help our clients make the best recovery possible. Johnson vs. Truline (actual pictures) $1.3 Million dollar verdict. Pahrump, NV Rule vs. Rule (pending case) (truck vs. truck accident) Battle Mountain, Nevada Pierce ($2.4M settlement) I-15 Nevada. Nothing could be scarier then a truck that has lost its brakes. Heavily inclined roads are usually constructed with run away truck ramps that are filled with gravel to lessen the damage and slow a fast moving truck. Runaway trucks can smash into homes causing tragic results. The brakes on trucks must be vigilantly inspected and constantly tested to prove they work. Unlike aircraft, independent trucks may skip maintenance to save money causing brake pad failure. Brake lines that are not inspected may bleed causing a total hydraulic failure or air brake failure. It is important to get the vehicle inspected prior to any truck repairs to ascertain who may be liable in a truck accident. A failure to do this may relieve a paying party of their legal obligation to pay simply because the proof is missing. Do not let a repair occur to a rig until our attorneys have investigated the physical damage. Clark County, Washoe County, Elko County, Carson City County, Douglas County, Humboldt County, Lincoln County, Nye County, Esmeralda County, Mineral County, Storey County, Pershing County, Whitepine County, Lander County, Eureka County, Lincoln County, Churchill County and Lyon County. Trucks seen on highways usually come from the following manufacturers: American Coleman, Peterbilt, Pro Star International, Western Star, Hino, Sterling Trucks, Volvo trucks, Ford, Freightliner, Kenworth, Mack, and Navistar International, Izusu, and Mitsubishi. 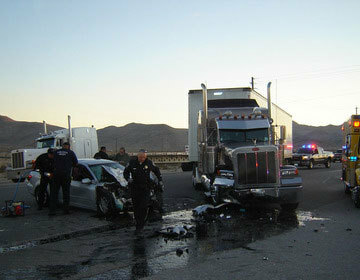 If you have suffered a trucking accident and need a Nevada trucking lawyer, call us today. Is Enough Modern Day Technology being Equipped on Big Rigs in Nevada?